One day, I stumbled upon Serge the Concierge. Serge Lescouarnec, the owner of the blog offered a Cooking and Manga on Menu for Everyday Harumi book contest part 3. I submitted my answer of a Manga on Food and Cooking. Manga was a part of my childhood. I still recalled, I used to watch “Born to Cook” or “Mr. Ajikko” on TV every Sunday morning. I wouldn’t have my breakfast until this series was on. I was so happy that the Manga’s story brought me to get Everyday Harumi cookbook. Eventually, I couldn’t see the book since I asked Serge to send it to my Winnipeg’s address. As I work out of Winnipeg which is in Boissevain, I used to be back on the weekends. However, I hadn’t returned to Winnipeg until this weekend. I was so glad to see that the book has a guidance on how to make dashi from scratch, so I don’t need to deal with MSG. The ingredient that I have been trying to avoid and is used in most dashi products. Making dashi was easy!!! All you need is water, kombu (dried kelp) and katsuobushi (Dried Bonito Flakes). I went to Arirang, a Korean store that has widely selection of Korean and Japanese products. For your information, in Winnipeg, most Japanese/sushi restaurants are owned by the Koreans. Another information that I need to share, bonito is made from tuna. For Indonesians who live in Sumatra area, you may to substitute bonito with ikan kayu (Acehnese dried skipjack tuna). On page 19 and 20 of Everyday Harumi cookbook, it is stated that many people who make their own dashi stock will make what is known as ichban dashi (fisrt brew) and niban dashi (second brew). 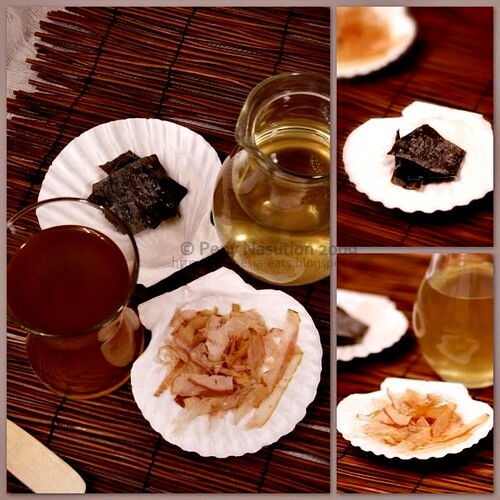 The first is usually used when we need a pure dashi flavour and the second when it is mixed with other ingredients. 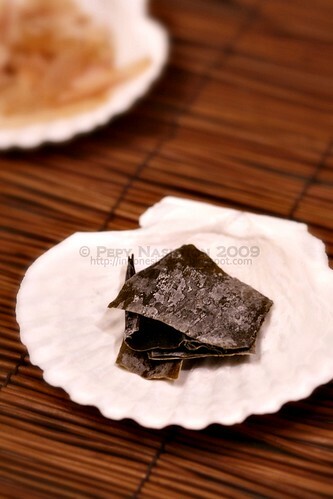 You will notice that the Ichiban dashi has a darker colour than the niban one. 1. To rempve any excess saltiness from kombu, either quickly wash under cold runnung water and then pat dry or wipe with a damp cloth. 2. In a large saucepan, soak kombu for 30 minutes in 4 cups of water. 3. Put the saucepan over high heat and remove kombu just before the water comes to a boil. 4. Add katsuobushi, bring back to a boil, and then immediately turn off the heat. Let it stand until all the flakes have sunk to the bottom of the saucepan. 5. Pour the mixture through a strainer lined with cheesecloth, leave to cool, keep the dashi stock in the refrigerator until ready to use. Do not discard the used karsuobushi if you want to make a niban dashi stock. 1. Add the previously used kombu seaweed and katsuobushi to a saucepan together with another 4 cups of water. 2. Put the pan onto medium heat. 3. Remove kombu just before the liquid comes to a boil, then cook for further 3-4 minutes. 4. Pour through a strainer lined with cheesecloth. Cool and store in the refrigerator until ready to use. Glad you found the cookbook you want! I read a review on this cookbook somewhere, sounds great, would love to get my hands on one too! I love cookbooks like these – the teach and they record some history.Happy Holidays! I love cookbooks like these – the teach and they record some history. Happy Holidays Everyone.I will make another dish from this cookbook by using dashi. I've also always wanted to buy Harumi cooking book, but haven't ordered it yet till now. I grew up reading manga too :)!! But I don't know "Born to cook", the only TV series I can remember right now is just "Doraemon"…;-). There is also another good cooking-related manga series called "Master Cooking Boy", rather exaggerating at times, but it could make you salivate while reading the manga. I will make another dish from this cookbook by using dashi. How long can we keep the home-made dashi in the fridge pep?